The Erie County Health Department is dealing with an unusual double-barreled health problem—a measles case and an active case of tuberculosis. The measles patient arrived from an unspecified Eastern European country November 27 and is believed to have been infected there. Health Commisioner Dr. Gale Burstein says even one case of measles qualifies as an outbreak. She says the case is being handled quickly. Health Commissioner Dr. Gale Burstein talked about the measles case Wednesday. "Last last night, the Erie County Department of Health has confirmed that the individual treated at Millard Fillmore Suburban did have a positive test for measles. 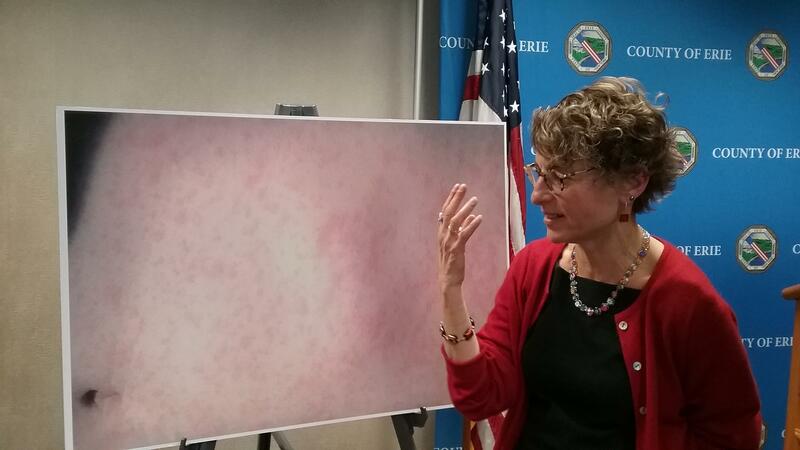 That individual has visited multiple venues in Erie County and potentially exposing others to measles between December 4 and December 11, 2018," Burstein said at a news conference Wednesday afternoon. The Health Department says measles is a highly contagious respiratory disease caused by a virus that is spread by direct contact with nasal or throat secretions of infected people. People first develop a fever, then may have a cough, runny nose and watery eyes, followed by appearance of a rash. People are considered infectious from four days before to four days after the appearance of the rash. Symptoms usually appear 10-12 days after exposure but may appear as early as seven days and as late as 21 days after exposure. The tuberculosis patient in an employee of the Williamsville School District, potentially affecting 185 students in three different schools. Burstein says the case was standard. "This individual was diagnosed in the hospital and had symptoms that were typical of TB and the testing and the evaluation including what's called the sputum testing, testing what that person coughs up," she said. A spokesperson for the Williamsville Central School District says the district was recently notified by the Health Department that specific students were exposed to active tuberculosis. The department notified parents of those students in a letter dated December 7 and those parents were instructed to have their child screened. Families that did not receive a letter do not need to take any action. Neither the measles patient nor the TB patient is being identified in any way. "Millard Fillmore Suburban Hospital has confirmed that an individual who reported to the Emergency Department on Monday, December 10th has tested positive for measles. Hospital staff took immediate measures including placing the patient, who was clinically stable, on appropriate airborne isolation. The patient was treated and released. As per protocol, the New York State Department of Health was notified and all patients, family members and hospital staff that were in the Emergency Department on Monday, December 10th (between 9:00 a.m. and 5:30 p.m.) are being advised of the exposure. They will be given follow up instructions. The patients’ identity will not be released due to Federal privacy law. Individuals with additional questions or concerns may contact the hospital’s Infection Prevention Office at (716) 568-3999, Erie County Department of Health at (716) 858-7697 or their primary care provider."